Maker is comprised of a stable coin, collateral loans, and decentralized governance. 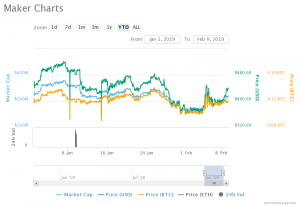 The 19th largest cryptocurrency – Maker with its current market cap traded at $320,859,559 (04:25 UTC) on February 09 dipped in current value by 17.6% compared to January 06 as analyzed from the graph above. Let us not forget that the strong bearish pressure that caused a dropped in value. Let us not forget that the MKR/USD pair gained in value on January 31 by 19.6% that signifies the bullish trend. Amid the entire scenario, the MKR/USD pair remained ‘uptrend’ from January 22 to January 25 as interpreted from the graph above which signifies the bullish trend. Both the moving averages declined since mid-November last year thereby creating downward pressure over the value as interpreted through the line in the graph above. However, the current value trades about the 20-day EMA stating the “uptrend” thereby offering the best return. Traders that would like to create a long position, the current uptrend in value provides a tremendous opportunity. Now let me walk you through certain milestone that this cryptocurrency attained in the recent past. The MKR/USD pair remained range bound from December 11 to January 05 as the cryptocurrency rallied from a low of $318 to a high of $543 which is a 70.7 percent return within 25 days. As we can quickly analyze from the graph above that the MCap trades at $320,859,559 (04:25 UTC) on February 09 with the Price (BTC) 0.12067987 and Price (USD) 441.10, 24h Volume 632,228 USD (04:28 UTC). If we estimate from the chart above that Price, BTC traded all-time high 0.13452018 above all, and since then it dropped and again gained in value on February 05 until today which elaborates the fact that this altcoin is poised to offer the best to all those that have invested. While we can estimate from the first graph, since bulls succeed in rising and sustaining above the current resistance level $423 (04:39 UTC) and create “uptrend” in value (i.e., traded above the EMA) the investors will start buying this currency more and more thereby increasing its value. However, based on the current trend, the next support level could be $447. Let us elaborate more about Maker which is one of the smart contract platforms on Ethereum that backs and stabilizes the value of Dai through a dynamic system of Collateralized Debt Positions (CDPs), independent feedback mechanisms, and appropriately incentivized external actors. The entire story is not confined up to here, as Maker enables anyone that would like to leverage their Ethereum assets to generate Dai on the Maker Platform. Once created on the platform, Dai can be used in the same manner as any other cryptocurrency where it can be freely sent to others, used as payments for goods and services, or held as long term savings. So much so that, the generation of Dai also creates the components needed for a robust decentralized margin trading platform! Please feel free to visit https://makerdao.com/ to know more about this cryptocurrency!